While Abdullah served as a close U.S. ally and was considered a reformer by many, Saudi Arabia has long been criticized by human rights activists for its treatment of women and its enforcement of a strict interpretation of Islamic law. President Barack Obama is scheduled to travel to the Saudi capital of Riyadh on Tuesday to pay respects to Abdullah and meet with Salman, who also has been seen as a moderate friend of the United States. Salman is further accused by Baer of having "personally approved all important appointments and spending" at the International Islamic Relief Organization (IIRO), a controversial Saudi charity that was hit with sanctions following the attacks of September 11, 2001, for purportedly providing material support to al Qaeda. Salman also has been reported to be responsible for sending millions of dollars to the radical mujahedeen that waged jihad in Afghanistan in the 1980s, according to Bruce Riedel, a former CIA officer who is now director of the Brookings Intelligence Project. "In the early years of the war—before the U.S. and the Kingdom ramped up their secret financial support for the anti-Soviet insurgency—this private Saudi funding was critical to the war effort," according to Riedel. "At its peak, Salman was providing $25 million a month to the mujahedeen. He was also active in raising money for the Bosnian Muslims in the war with Serbia." Salman also has embraced radical Saudi clerics known for their hateful rhetoric against Israel and Jews. Salman has worked closely with Saleh al-Moghamsy, who tweeted in August 2014 that "Allah only gathered Jews in the land of Palestine to destroy them." Al-Moghamsy also stated in a 2014 television interview that "the hatred of Jews toward Muslims is an eternal hatred." He also claimed in 2012 that Osama bin Laden had died with more "sanctity and honor" than any infidel, or non-Muslim. Despite this rhetoric, Salman has maintained close ties to al-Moghamsy. Salman chairs the board of an organization run by al-Moghamsy and has sponsored the cleric’s public events, including a 2013 festival. 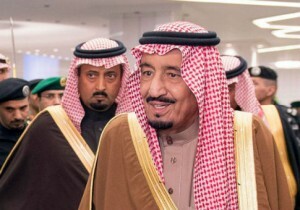 Salman and al-Moghamsy were pictured many times together at that event, according to regional reports. Al-Moghamsy also has been an adviser to two of Salman’s sons, one of whom posed for a selfie with the cleric in July. Salman also has reached out to other hardline preachers, including Safar Hawali, a one-time mentor of Osama bin Laden who has called for non-Muslims to be expelled from Saudi Arabia. In 2005, Salman called Hawali to inquire about his health and in 2010 praised him upon the release of a book. While crown prince, Salman also made a point of phoning Aidh Abdullah al-Qarni, a Saudi author currently on the U.S. Terrorist Screening Center’s No Fly List who has praised Hamas and called Israelis "the brothers of apes and pigs." Additionally, Salman, in his role as crown prince, has recently visited Saudi Arabia’s grand mufti, the nation's highest religious authority, who has asserted that 10 is an appropriate age of marriage for girls and called for the destruction of all churches in the Arabian Peninsula. Weinberg, who has been tracking Salman closely, said that the new monarch is taking up his predecessor’s mantle of moderate reform. "Just like King Abdullah tried to present himself as a reformer, some are trying to suggest that the new king, Salman, is a moderate who will continue his half-brother’s so-called progressive policies," Weinberg said. "But just look at where Saudi Arabia is after Abdullah: people are being decapitated and flogged by the state in the streets." "Women are systematically oppressed by their own government, and the regime continues to propagate incitement and intolerance," he continued. "Salman’s background funding mujahedeen abroad and embracing hateful clerics suggests that he is at best a political opportunist who will tolerate continued religious extremism, even if he does not hold such views himself."